FEMA continues to solicit comments on the Public Assistance Deductible Supplemental Advance Notice of Proposed Rulemaking (SANPRM) until April 12, 2017 at 11:59 p.m. ET. The Public Assistance Deductible will create an incentivized system that encourages additional investments in mitigation, risk-reduction, and preparedness. As the concept is still in the early stages of development, FEMA is seeking comment on all aspects of the deductible, including whether there are alternatives that will better achieve FEMA’s objectives of lowering future disaster costs through increased investments in risk-reduction. The framework is described in full detail in the Supplemental Advance Notice of Advance Rulemaking (SANPRM) available for comment on www.Regulations.gov Docket ID: FEMA_FRDOC_0001 and on the Federal Register as Document Number 2017-00467. If you have any questions about the deductible or experience difficulty posting a comment, please contact Colt Hagmaier at [email protected]. On April 7, FEMA published a Federal Register notice to seek public comment on a draft Nationwide Programmatic Environmental Impact Statement (NPEIS) about the National Flood Insurance Program (NFIP). As required by the National Environmental Policy Act (NEPA), FEMA developed this draft NPEIS to examine the impacts of proposed improvements and modifications to the NFIP. This draft NPEIS includes an evaluation of the potential impacts to the natural and human environment associated with the NFIP at a programmatic level, as well as an evaluation of impacts of alternative proposals to modify the NFIP. The NFIP proposed modifications are needed to implement the legislative requirements of the Biggert-Waters Flood Insurance Reform Act of 2012 (BW-12) and the Homeowner Flood Insurance Affordability Act of 2014 (HFIAA), and to demonstrate compliance with the Endangered Species Act (ESA). Today, more than 22,000 communities participate in the NFIP, with more than 5.1 million NFIP policies in effect, providing over $1.2 trillion in insurance coverage. The NFIP serves as the foundation for national efforts to reduce the loss of life and property from flood disaster. The public comment period is open for 60 days from April 7, 2017 to June 6, 2017. Download a copy of the draft NPEIS and provide comments directly to FEMA via www.regulations.gov. Search for Docket ID FEMA-2012-0012. In addition, public meetings and webinars are scheduled by FEMA to allow the public an opportunity to learn more about the project and to provide comments on the NFIP draft NPEIS. For a list of locations and webinar dates and times, visit www.fema.gov/programmatic-environmental-impact-statement. FEMA issued an update to the Public Assistance Program and Policy Guide (PAPPG), effective for all disasters declared on or after April 1, 2017. The Public Assistance Program and Policy Guide (PAPPG) combines all Public Assistance (PA) policy into one consolidated document. The PAPPG also includes an overview of the PA Program implementation process, with links to other publications and documents that provide additional process details. re-organizing the Appendix on Cost Effective Hazard Mitigation Measures to list the mitigation measures by items being mitigated as opposed to specific types of facilities and adding similar low cost mitigation measures. Questions and comments on the PAPPG can be sent to [email protected]. Each year for Arson Awareness Week, the U.S. Fire Administration (USFA) gathers and shares information to raise awareness of arson or youth fire-setting and provide individuals with strategies to combat these problems in their community. Arson Awareness Week will be from May 7-13 this year and USFA is providing shareable content about how to help community leaders increase awareness about how to prevent arson at houses of worship. The burning of a house of worship not only devastates the affected congregation, but wounds the entire community. Whether the motivation behind the arson is hate or reckless vandalism, a congregation views it as an attack on their beliefs and values. Arson robs congregations of their valuable assets, lives and property. Arson destroys more than the buildings used as houses of worship; it can devastate a community, resulting in the decline of the neighborhood through increased insurance premiums, loss of business revenue, and a decrease in property values. Houses of worship are particularly vulnerable to fire damage because they’re often unoccupied for long periods of time, and in many cases, in rural areas. Rural properties will generally sustain more severe damage – even with an accidental fire – since discovery and response time may be delayed. USFA is also hosting a “Preventing Arson at Houses of Worship” webinar on Tuesday, April 25 at 1 p.m. ET. Participants can register for the webinar online. FEMA’s annual funding opportunity for the Fire Prevention and Safety (FP&S) Grants opens next week. FP&S Grants are part of the Assistance to Firefighters Grant and support projects that enhance the safety of the public and firefighters from fire and related hazards. The application period for the Fiscal Year (FY) 2016 FP&S Grants will open on Monday, April 17, 2017, at 8 a.m. ET and will close on Friday, May 19, 2017, at 5 p.m. ET. A total of $34.5 million will be available. The primary goal of these grants is to reduce injury and prevent fire-related deaths among high-risk populations. In 2005, Congress reauthorized funding for FP&S and expanded the eligible uses of funds to include Firefighter Safety Research and Development. For more information on fire prevention grants, visit www.fema.gov/fire-prevention-safety-grants. FEMA congratulates the 20 students who graduated from the National Emergency Management Basic Academy on March 23, 2017. These students completed the full Basic Academy curriculum which provides the basic knowledge and skills to help meet the unpredictable challenges in the field of emergency management. Graduates represented emergency management professionals from federal, state, county governments, local, and education establishments. FEMA’s National Emergency Management Basic Academy is the entry-point for individuals pursuing a career in emergency management. The Basic Academy offers the tools to develop comprehensive foundational skills needed in emergency management. For those who are new to emergency management, the Basic Academy also provides a unique opportunity to build camaraderie, to establish professional contacts, and to understand the roles, responsibilities, and legal boundaries associated with emergency management. The Basic Academy is the first of a three-level Academy series in the Emergency Management Professional Program (EMPP). The EMPP curriculum is designed to provide a lifetime of learning for emergency management professionals and includes three separate, but closely threaded, training programs building from the Basic Academy to the National Emergency Management Advanced Academy, a program to develop the next generation of emergency management leaders who are trained in advanced concepts and issues, advanced leadership and management, and critical thinking and problem solving; and culminating in the National Emergency Management Executive Academy, a program designed to challenge and enhance the talents of the nation’s emergency management senior executives through critical thinking, visionary strategic planning, challenging conventional concepts, and negotiation and conflict resolution applied to complex real-world problems. Emergency management professionals should visit www.training.fema.gov/empp for more information about which academy best suits their needs. FEMA’s Emergency Management Institute (EMI) is hosting a webinar emphasizing the value of increasing engagement with faith-based organizations for disaster preparedness on April 12 at 2-3:30 p.m. ET. The webinar is a joint effort between the DHS Center for Faith-based and Neighborhood Partnerships and FEMA’s Higher Education Program that will provide a forum to help to ensure emergency managers, faith-based and community organizations are aware of academic partner resources and engagement opportunities. Participants can register for the webinar online and use the conference call-in (800) 320-4330; PIN: 376368#. FEMA’s EMI Virtual Tabletop Exercise (VTTX) program will offer a flood scenario May 24-25, 2017. The VTTX is designed to help emergency management professionals exercise their response to the impact of major flooding on their community. The VTTX involves key personnel discussing simulated scenarios in an informal setting, and can be used to assess plans, policies, training, and procedures during a flood and inundation challenge. The VTTX occurs 12-4 p.m. ET. To participate, send an email to [email protected] or call 301-447-7645. Also, send a courtesy copy email to [email protected] or call 301-447-1381. The application deadline is May 1, 2017. Additional information is available athttps://training.fema.gov/programs/emivttx.aspx. 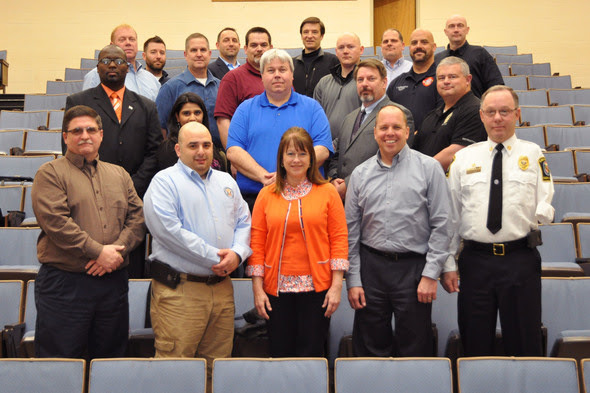 EMI is accepting applications for the National Emergency Management Advanced Academy. This program addresses program management and oversight, effective communication, integrated collaboration, and strategic thinking skills. The target audience is mid-level managers who have a minimum of three years of experience in an emergency management position to include government, non-profit, voluntary organization, and private sector leaders who are responsible for emergency management or homeland security. The Advanced Academy Program consists of four resident courses and is five days in length. Classes begin in October, November, or December 2017 and are ideally taken sequentially through September 2018. Applications will be accepted until May 31, 2017, with selections in June and announcements in July. For more information, contact [email protected]fema.dhs.gov.